Border trade between Myanmar and Thailand totaled about 1.4 billion U.S. dollars in the first half of fiscal year (FY) 2018-2019 which started in October last year, according to the figures from Myanmar’s Ministry of Commerce Saturday. 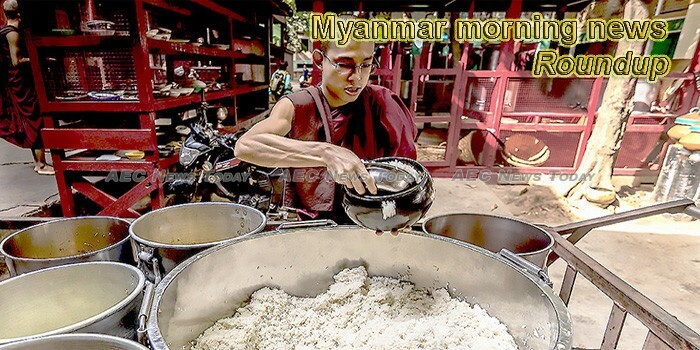 The Myanmar processed food industry needs more investment support in order to develop further, U Aye Win, chair of the Myanmar Food Processors and Exporters Association, told The Myanmar Times. A government delegation led by U Khin Zaw Oo, Secretary of the Peace Commission, met informally with ethnic armed organizations (EAOs) in Chiang Mai, Thailand, over the course of three days last week to negotiate resuming their participation in formal dialogues with the government and Tatmadaw for Myanmar’s peace process. The government should address high transportation costs in the country to attract more tourists, the head of a local entertainment company said on Sunday. Tanintharyi Region Chief Minister Daw Lei Lei Maw was arrested on bribery and corruption charges in Dawei on Sunday, according to the Anti-Corruption Commission (ACC). Myanmar’s aviation market suffered a slowdown in growth in 2018 following a decade of positive passenger traffic. In addition to BPO services, Lan Thit Masterpiece also offers market research, customer surveys, ground marketing, and social media management. A Ukrainian company and the Myanmar military have signed a joint-venture agreement to build a plant capable of manufacturing armored personnel carriers (APCs) and self-propelled howitzers, the Myanmar website The Irrawaddy reports. Chinese companies are pushing to resume destructive dam projects, ignoring a key assessment. The province of Yunnan, a major front in China’s anti-drug campaign as it borders the Golden Triangle known for drug production and trafficking, has vowed to launch a new round in the war on drugs and recruit more special border police to safeguard stability. An ethnic insurgent group, the Arakan Army (AA), has attacked a boat carrying policemen in Yathedaung township, Myanmar’s Rakhine state, leaving one policeman missing, according to the Myanmar Police Force Monday. The 10 ethnic armed organizations that have signed the Nationwide Ceasefire Agreement (NCA) have decided to meet with government peace negotiators after one of the groups voiced deep dissatisfaction with the country’s peace process, RFA reported. Measles is an airborne disease which spreads easily through the coughs and sneezes of infected people. It may also be spread through contact with saliva or nasal secretions and sharing living space with an infected person. The 56th Myanmar Gems Emporium is due to start in the capital city of Nay Pyi Taw today, expecting to attract over 2,600 gems merchants from China, Thailand, Australia and the United States, Xinhua reported. Coloured waste bins line the walls of RecyGlo’s office in Yangon. Blue is for paper, red for plastic, green for aluminium and black for general waste. Myanmar citizens based in Singapore snapped up US$6 million worth of apartments and condominium units in Yangon at a two-day real estate fair held in the city state earlier this month. Officials from the International Criminal Court are in Bangladesh as part of a preliminary examination of whether a prosecution over the alleged deportations of Rohingya could be mounted, a U.N human rights investigator said on Monday.